Happy 2019! Happy New Year! So I jumped over to my professional platform to do a quick blog post about the power of the Yes manifest or how positive thinking translates to a positive life and it propelled me to share how this positive mantra should also be brought over to family life and relationships in 2019. Full disclaimer, Jamaican Mommies has partnered with new mom and Kill Fear Now Author, Krystal Tomlinson to host our “vision board with a view party” on Sunday, January 27. It promises to be amaaaaazing so please be sure to rsvp via information on the attached flyer. But this post is much more than this. You see I believe in the power of positive affirmations and attracting all the things you are truly ready for, but I also believe that sometimes we are so buried under our own fears and burdens that we are ill equipped to even be ready to receive any positive movements in our lives. Having visited a vision board party or two and having created my versions of boards, wheels and them some and seeing my greatest wishes unfold as manifested, this has certainly helped me to clarify where my current mindset is, what my greatest goals are and the steps required to get me towards those goals. It is for this reason that the Jamaican Mommies vision board event was created. It touches on a very specific area that many other “strategy lists” “vision boards” “resolutions” or “task sheets” tend to overlook. When you compile your “New Year, New You” lists, Are you scheduling goals and visions for you to be a better person for yourself as well as for your family? What about the investment for your physical health? mental well being and your positive approach to life? What of your relationship with family? Is this front and center in your 2019 goals? In creating a vision board, the lure is there to focus on the materialistic or career goals. But news flash, in creating a wholesome and balanced life, the self care and family life aspects demand as much attention. I promise, you can start small. Add a task such as “Hug More”, “Ask my child about their day” “Try to use more positive words with my partner” and scale from there. The Jamaican Mommies vision board party will help you to do just this-to look beyond the typical “goals” and to focus on the relationship and emotional connectivity side of our human nature. We wanted to make this decidedly life changing and our “with a view” venue paired with cocktails was strategically chosen to help every mom in attendance focus on the task at hand. So what are you waiting for? Let’s collectively say YES to our best selves yet. 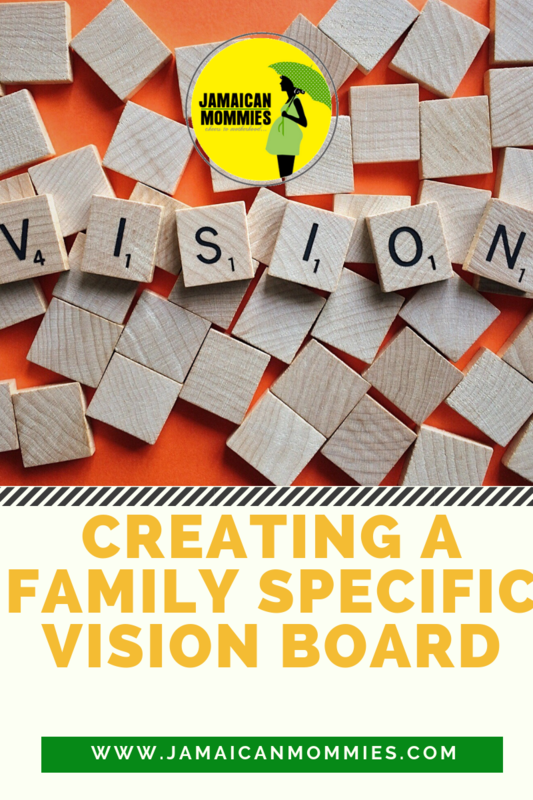 rsvp for the Jamaican Mommies vision board party and take the first step towards a fulsome 2019 which gives equal attention to connectivity and your other goals. I’m too excited to see everyone there.